Govan’s brigade brushes aside the 15th and 49th Ohio of Willich’s brigade. Continuing south, Govan encounters Van Derveer’s Federals in the woods, catching them by surprise. Soon the Federals are also beating a hasty retreat. 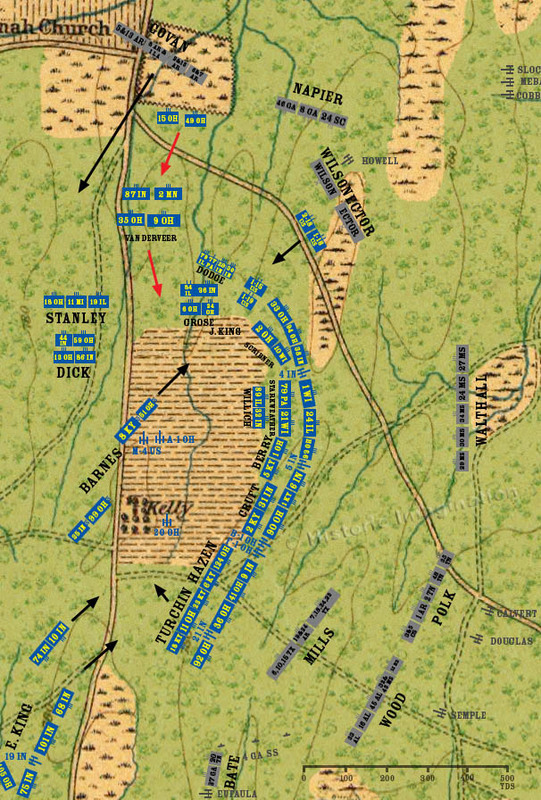 The 1st and 2nd Battalions, 18th U.S. halt their counterattack when they encounter Ector and Wilson. They retire back to their original position in good order. Barnes brigade splits as it enters Kelly Field. Two regiments move across the field to support Baird’s division, while the other two temporarily lose their way. At the south end of the field, General Reynolds pulls his division back to protect his flank.